Niacin is a water-soluble B vitamin, which is also known as vitamin B3 or nicotinic acid. Nicotinamide is the derivative of niacin and used by the body to form the coenzymes nicotinamide adenine dinucleotide (NAD) and nicotinamide adenine dinucleotide phosphate (NADP). Nicotinic acid and nicotinamide are rapidly absorbed from the stomach and the intestine. Niacin deficiency may result from inadequate dietary intake of niacin and/or tryptophan. Other nutrient deficiencies may also contribute to the development of niacin deficiency. When chicks hatch they have considerable tryptophan contained in the protein of the yolk, if it is fully absorbed. Chicks are at risk of niacin deficiency if the starter feed contains low levels of the amino acid, tryptophan or niacin. Most chicken corn-based chicken feeds provide limited levels of tryptophan. Niacin deficiency in young chicks most commonly presents as enlargement of the hock joint, bowing of the legs similar to perosis, poor feathering, and a dermatitis on the feet and head. Niacin deficiency in adult chickens presents as severe metabolic disorders in the skin and digestive organs. Clinical signs include loss of appetite, weakness, digestive disorders and diarrhea. Niacin is widely distributed in feedstuffs of both plant and animal origin. The best food sources of niacin include distiller’s grains, Brewer's yeast, beets, fish, various distillation and fermentation solubles, sunflower seeds, and certain oilseed meals. The availability of niacin in grain and grain by-products is very low. 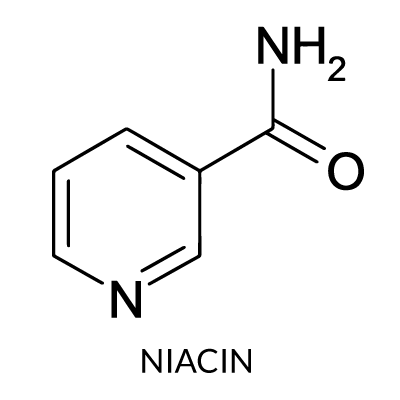 Other sources of niacin include tablets or capsules in both regular and timed-release forms. In the calculation of the niacin content of formulated diets, probably all the niacin from cereal grain sources should be ignored or at least given a value no greater than one-third of the total niacin. The bioavailability of niacin depends on the predominate grain source used in the feed. Soybean meal provides 100% bioavailability of niacin, while wheat, sorghum, and corn varies from 0 to 30%. In addition, different strains of chickens have different niacin requirements. Rapidly growing broiler chicks require more niacin because of the faster gains of modern strains of birds as compared with more historical populations. Supplementing diet with niacin or products containing high quantities of niacin. If caught early enough, before tendon slips from its condyles then recovery is good. Tetracycline antibiotics interfere with absorption.